You are currently browsing the Pet Auto Safety weblog archives for March, 2012. This article is a shorter version of the article we wrote on another blog (for the full story, visit the American Dog Blog). But we have added a bit about pet travel safety. Some of the things you can do with your dog this spring can be done at your own home in your own backyard, while others you would need to take your dog in the car. If you go do a dog park or visit some pet-friendly attractions, make sure your dog is wearing a dog car harness or using another pet travel safety product. There is so much to do when the weather is nice so get out there and have fun! We just published an article on Hub Pages with this title and thought we would share it here on our blog. Some dogs just won’t tolerate a car seat belt harness. They try to escape from it and oftentimes succeed, defeating the purpose of protecting them in the car. Rather than try to find a harness which they can’t escape from, consider training to get your dog used to a dog car harness. Practice by having your dog wear his dog car harness around the house, supervised, and for only a few minutes at a time. Reward your dog when he wears his harness around the house without trying to get it off. Distract your dog with fun games or delicious treats while he is wearing the dog car harness around the house. Walk your dog in his dog car harness. Getting a car seat belt for dogs which is too tight or supposedly inescapable does not keep your dog from struggling to get out of them. Training is by far a safer option for your pet. Training will keep him from hurting himself when he struggles to get out (because he won’t struggle anymore) and it will make him happier on road trips because he will have been trained to no longer worry about the dog car harness. To read the whole article, visit our Hub Pages at http://naturebydawn.hubpages.com/hub/Getting-Your-Dog-Used-to-a-Dog-Car-Harness. One of our customers shared this photo of their dog with the Hatchbag pet car net. We always love to hear from our customers. We especially love it when they share pictures of their pets. We recently received two great reviews for our pet travel products. Viv in Canada purchased a Hatchbag pet car net. We don’t usually ship to Canada because of the expensive shipping, but an exception was made because Viv originally purchased the pet car net in the US but it was too big. So we exchanged for a different size and sent it to her in Canada. Thank you Viv! You puppy must be the big cuddly kind. 🙂 Thanks for sharing your experience and for sending us a photo (above). Charlotte in Arkansas purchased a Lookout pet safety seat. She has not sent us a photo yet, but here is what she has to say about her new pet safety seat. Thank you, Charlotte! We are glad Lucy is riding safe and that she loves her new pet safety seat. Have you purchased any pet travel products from us? Please email us at naturebydawn@aol.com with your experience. Please feel free to share a photo too! If you travel regularly with your pet or if you are planning a long road trip with your pet, the “AAA Traveling with Your Pet” might be a helpful book. Twelve of the 700 pages are dedicated to providing you with tips on traveling with your pet while most of the other pages are dedicated to giving you information on US pet-friendly lodgings. The 12 pages of tips for traveling with your pet include topics such as should your pet travel, preparing your pet for travel, traveling by car, traveling by air, in case of emergency, outdoors, traveling in the US and Canada, and traveling internationally with your pet. There is a good check list for what to take when traveling with your pet but it surprisingly does not include a dog car harness. It does mention a crate, which is also safe for your dog (safer if the crate is strapped in). The section on traveling by car is a bit more informative. It does mention a dog car harness. It also gives you tips on how to train your dog to ride in the car and advises that your dog should not be left alone in a parked car, should not be allowed to hang their head out the window in a moving car, that you should stop ever two hours for your pet, and more. The in case of emergency section is very small. It tells you to keep an emergency pet hospital number handy. There is another small section which indicates prevention, symptoms, and first aid for heatstroke and hypothermia. But while “AAA Traveling with Your Pet” does state that you should travel with a first aid kit, it does not give much first aid advice. All-in-all, these 12 pages are very skimpy and not as informative as they could be. The other 600+ pages are dedicated to pet-friendly places and lodgings. The US pet-friendly lodgings section is the largest (almost 550 pages). We have read reviews online which says this list is not very comprehensive. I can imagine that it would be very difficult to contact every single hotel and inn in the United States to verify if they allow pets. And I can imagine that many hotels could easily change their policies and possibly go out of business. 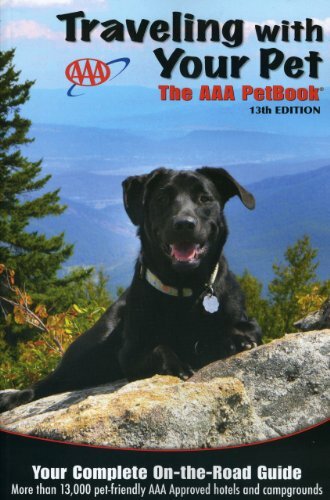 The edition of “AAA Traveling with Your Pet” that I have is the 13th edition. It currently lists more than 13,000 pet-friendly AAA approved hotels and campgrounds. Tomorrow it could have more, or possibly even less. If you travel regularly and are a AAA member who loves to get AAA discounts, this book can be very helpful. If you are not a AAA member but still travel regularly, this book might be helpful. But if you are just making one trip with your pet, this book is probably not worth the while. It is easy to find pet-friendly lodgings online. Pick a hotel and call them in advance to make sure they are not booked and that they allow pets. It will be much easier than trying to search the book when you are already on the road. My part in the parade is to assist the person wearing a dog costume. This person is promoting The Dog House, a local co-op pet shop located in Lawrence, Kansas. The Dog House sells mostly hand-crafted and homemade pet items such as pet apparel, dog beds, dog treats, and more. Other people in the parade will be walking their dogs and their dogs will be wearing St. Patrick’s Day clothes for dogs from The Dog House. The photo above is of a dog wearing such apparel. I hope to have more pictures of the parade later today. If you are in the area of Lawrence, Kansas, come check out the parade, and The Dog House too. And have a happy St. Patrick’s Day! Okay, I’m back with more photos from the parade! Here is Roxy in her St. Patrick’s Parade clothes for dogs. Here is another dog wearing green and some kids having a good time watching the parade. Here are all the people watching the parade! For more photos, visit our American Dog Blog. We recently discovered a new informational website which promotes pet travel safety. Perhaps you have seen them, dogs hanging out the window of a car, sitting on the driver’s lap, or riding in the back of a pickup? The dogs get our attention because they are cute, right? But the situation they are in is not safe. Paws to Click.com is working to change our perception on pet travel by helping us to recognize unsafe situations. By putting your pet in a pet travel safety restraint, you are helping to protect your pet in the event of a car accident, just like wearing a seat belt helps to protect us. But restraining your pet in the car not only protects your pet, it protects you and the passengers as well. According to their website, unrestrained pets cause 30,000 car accidents each year. How? By being a distraction to the driver. Certainly someone driving a car can’t help but to be distracted by the poodle in their lap. And some dogs, like my Labrador, are hyper in the car and can be a distraction when they stand on the center console and pant in the driver’s ear. Another way that a pet travel safety restraint protects the driver and passengers is by preventing your pets from being a deadly projectile. In the event of a car accident, even a small dog can cause serious injury or even death to the person he is thrown into. If you protect your pet in the car with a pet travel safety restraint such as a dog car harness or secured pet travel crate, join the Paws to Click movement today by joining their website and signing their pledge today. Learn about their V9DT durability standard for pet travel safety. It costs you nothing but can save the thing you hold most dear – your family. Are you taking spring break with your dog? If so, don’t forget to keep him safe in the car when you travel. There are a lot of great pet travel products out there that your dog will love. And if he doesn’t love them, well, at least he will be safe. The weather is warm so roll down those windows and put your nose to the wind. But keep your pet safe too. The BreezeGuard window screens allow you to roll down the windows and let your dog get a whiff of the air, but they don’t let him put his head out the window. This keeps him in the car in the event of an emergency car maneuver or auto accident. And it also keeps your dog from being hurt by flying road debris. The BreezeGuard window screens are custom made to fit your vehicle and so can take 2-3 weeks to make. It may be too late to get them for spring break but I’m sure you will still be taking your dog for rides in the to the dog park this spring and summer. This is one of my most favorite pet travel products, next to the dog car harness that is. Even though my dogs wear a seat belt for dogs, the tether on their harness is long enough that they can still move around. The Kurgo Backseat Bridge gives them that room by covering the floor of the car and, in a sense, extending the seat. This is an especially great product for long road trips. Plus, your dog won’t get thrown on the floor in a sudden stop. Since seat belts can save people’s lives in a car accident, they can save your dog’s life too. Fortunately, there are a lot of seat belts for dogs out there on the market. Many have been tested for strength and durability but only one brand, Pet Buckle, has had them crash tested. But if your pet won’t wear a seat belt for dogs, there are other safety pet travel products you can use. If your dog doesn’t like to wear a dog car harness, secure them in a pet travel crate instead. Then secure the pet travel crate with kennel restraints. The kennel restraints from Pet Buckle are made from the same strong material as seat belt webbing. Plus they have been crash tested. They work by wrapping around the pet travel crate, then being secured with the seat belt system of your car. Don’t forget your pet’s food, water, leash, pet tags on your dog’s collar, poopie bags, and an emergency kit. It also helps to keep a copy of your pet’s vet records with you and an emergency phone number for your veterinarian. These may not be specifically pet travel products but they are important none-the-less. Unfortunately, I don’t get a spring break. But the dogs and I will still be taking some trips on the road this spring and summer. Maya and Pierson wear a seat belt for dogs, we use the BreezeGuard window screens and Kurgo Backseat Bridge. What sort of pet travel products does your pet use? Where are you taking your dog for vacation? The ten cities listed are Portland, Oregon; Chicago, Illinois; San Diego, California; Seattle, Washington; Philadelphia, Pennsylvania; Minneapolis, Minnesota; Austin, Texas; Alexandria & Washington D.C.; New York, New York; and Indianapolis, Indiana. Of these ten places, we have visited two. Check out our previous articles by clicking on Portland, Oregon and Austin, Texas. If you are thinking of other pet travel destinations, DogFriendly.com is a great website resource to check out. They list several pet friendly accommodations, veterinarians, dog parks, pet friendly shops, and pet friendly tourist attractions in various places all over the United States. They also have listings in Canada, Europe, and all over the world. Here are some other great pet travel products that we have heard about. For various reasons, we do not have them available on Pet Auto Safety.com. But you can read a little about them here and purchase them on Amazon.com. We like how this pet net barrier goes almost all the way to the top. It appears easy to install. And it looks like you can see through it. It has 45 reviews on Amazon and an average of 4 out of 5 stars. Most people say it works great. The few complaints from these reviews are that if it bends, it is difficult to straighten. Some say that it obstructs their view while others say they can see through it just fine. And as with all pet net barriers, some dogs have been able to circumvent it. Amazon has this great preview feature which allows you to look through the first several pages. From what we can see, this book is very informative. It includes tips on traveling with your pet, covers some emergency situations, talks about dog friendly places and lists lodgings and campgrounds in the US and Canada. The “Traveling with Your Pet: The AAA PetBook” has 28 reviews on Amazon and an average of 4 out of 5 stars. The few bad reviews were that the listings for hotels and such were not very complete and that the lodging information is best found online and by calling the hotels directly. By the way, I will be purchasing this book soon and will do a full review later. This is one of the pet travel products I really wish we had on Pet Auto Safety. One of the safest ways to protect your pet is to put them in a pet travel crate, then to strap that crate in with kennel restraints. We have kennel restraints but the only crates we have on our site are wire crates. 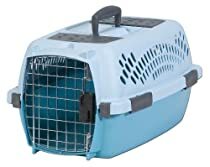 The plastic crates from PetMate would be perfect for pet travel. We are in the process of offering PetMate Pet Travel Crate products in the future. But for now you can get it on Amazon. It has only three stars on Amazon and 82 reviews. The negative reviews said that the plastic was too flimsy for actually carrying the crate while your dog is in it. We recommend that you put the empty crate in your car, strap it in, then put your dog in the crate. We used to have pet ramps on Pet Auto Safety.com. But they were very expensive. So when our supplier went out of business, we stopped selling them. Pet ramps are still relatively expensive pet travel products. But we have found one on Amazon for a reasonable price. Pet ramps are perfect for older dogs who have a difficult time getting up steps or into vehicles. This particular product has four stars on Amazon. The people who gave fewer stars claimed the ramp was too steep, their dog was afraid of it, or it was difficult for their dog to get a grip on the surface. Don’t get this ramp if your vehicle is really high off the ground. The grip issue can be solved with a beach towel and the fear issue can be resolved with training. Does your dog get nervous in the car? These Travel Calm tablets may help. This product has four stars on Amazon but only nine reviews. Of the nine, two were bad reviews. One person said their dog wouldn’t eat it and another person said it didn’t help their dog. My guess is that since there are seven other great reviews, this product will help most dogs but may not help some dogs. For a product under $10 it is worth a try. I must confess that we have not tried these products out ourselves. But they have good reviews on Amazon. And they are products which we may consider having on Pet Auto Safety.com in the future. For now, you can visit our Amazon Pet Travel Products Store for these great pet travel products.